Plan a trip to the Kemmerer, Wyoming area for the experience of a lifetime. On a long road trip across the country, we did a lot. 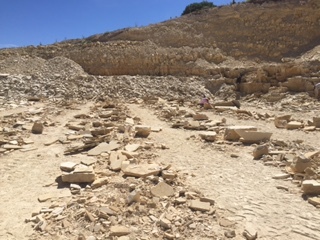 But the absolute highlight of our trip — and maybe the best outing we’ve ever had — was our time fossil hunting at Fossil Safari at Warfield Fossil Quarries. 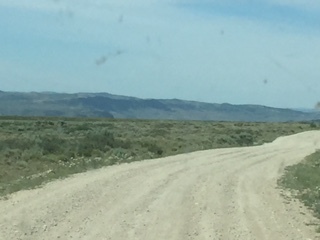 A science teacher friend had recommended going to the Kemmerer area in southwestern Wyoming and explained how you can hunt fish fossils and keep what you find. We never heard of such a place. After spending a day exploring and learning about the area at Fossil Butte National Monument, we decided to visit Fossil Safari at Warfield Fossil Quarries later that week. We are so glad we did. We found so many fish fossils! The staff was patient and helpful. They want to help you be successful in finding fossils. My family of four, including two children ages 9 and 10, all found fossils. 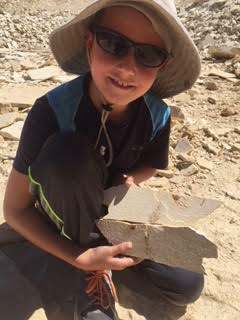 My nine year old was the first to find a fossil — a full fish fossil — in about 10 minutes. It was a great value for the number of fossils we found and for the overall experience. We chose Fossil Safari because of several positive local reviews. They seemed have the best prices and value of all the competition. It wasn’t crowded. We also loved that we didn’t have to reserve a time to be there. Just show up! You don’t have to make a reservation. George, the manager, or another employee will meet you in the office to answer questions, collect payment, and to have you sign a simple waiver. There are fossils and other things for sale but we hardly looked as we were so excited to get started and forgot to stop back on our way out. They will give you a card with the types of fish fossils you might find so that you could identify them later. We each took a hammer and a chisel then walked out to the quarry for a quick lesson in how to find fossils. 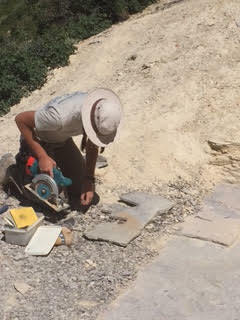 George or another staff member will show you the safe and correct way to split open the rocks so that you can have many layers or “sheets” to look at. Most of the time, the sedimentary limestone will break in nice sheets. They will explain how your best chance of finding fossils is by staying in one place and splitting the rocks in one area at a time. After a few minutes of instruction, you are free to choose rocks and start splitting them open. We all found fossils within the first half hour. You decide in advance if you would like to stay for one hour, four hours, or eight hours (all day), and pay accordingly. Whichever rate you choose, know that you are getting a great value for the experience. Children 12 and under are half price. You will most likely find several fish fossils in just an hour but you will want to stay longer. It’s not crowded so you will be able to have a nice family experience. We couldn’t believe how time went so quickly. We stayed approximately three hours but could have stayed all day. It flew by and was very fun. It was as fun to look for the fossils as it was finding them. Besides the absolutely incredible experience of being able to find 50 million year old fossils, we loved several things about Fossil Safari. George, the manager, was working alongside the customers at the quarry and was always available to assist. He walked around to check on people and helped everyone who asked him. He was approachable and available and also left us to do our own exploring without hovering. We asked him for help and advice a few times, and he was always patient, helpful and good-natured. Another employee helped us identify a larger fish fossil we found. 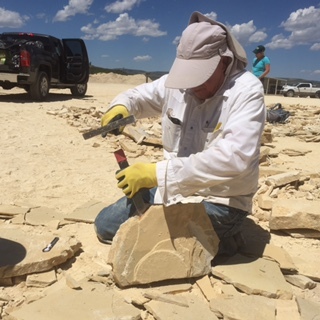 George helped us split rocks properly, including taking time to sit with my son, and helped break down some of our larger pieces into just the area around the fish fossil. He also had a lot of respect for the area. Later in the day, George said he thought of each rock as opening a 50 million year old book and not knowing what he will discover. There may be some who worry about not being able to keep any rare fossils you might find. To us, finding any fossils, much less 50 million year old fossils, was going to be exciting. If we happened to find a rare specimen, we knew we had to give it to the quarry. We were fine with this. We explained this to our kids in advance, and they understood the rules as well. How cool would that have been to have found one! We all laughed about it. Again, this was not an issue at all. 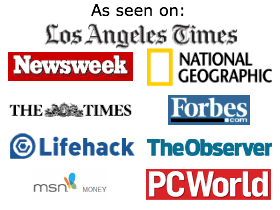 They offer the most competitive pricing and value in the area. Kids 12 and under are half price. They are open every day, from Memorial Day weekend through September, from 8 am – 4 pm. What is different about Fossil Safari from most of the other commercial quarries is that you can show up when you want to, without a reservation. We were there longer than we expected, about three hours. At any given time, and we were there on a Saturday afternoon in mid-July, there were only up to 15 other people in the huge quarry. Come prepared and be patient. You will find fish fossils, lots of them. It’s incredible to believe that on our family vacation we were able to find, touch, explore, and keep fossils from the Eocene Epoch, 56 – 33.9 million years ago. Hat: Everyone should wear a hat. If you have one that protects your neck, wear it. Pants: At a minimum, you will be bending down. Kids will most likely sit and kneel in the quarry. Jeans would be a great choice. Covered shoes: Don’t wear flip flops or sandals. Work gloves: We did fine without them but they would have been great to use, especially for the kids. Wear only what you won’t mind getting dirty. We were absolutely covered in dust. Know that you will be at 7,000+ feet in elevation. It will most likely be very hot and dry. While it seemed most adults were in a crouching position– not sitting down or kneeling unless they had knee pads — the kids were kneeling and sitting. While the hammer might be light for an adult, and adults can manage their balance, the kids needed to concentrate more on using the tools from a sitting and kneeling position. Be sure to wear pants you will be okay with getting very dusty. Map: Print out the map for how to get to Fossil Safari. Even if you have a GPS, bring the map. I did have internet access from my smart phone along the way, but don’t rely on it. Sunscreen: Apply sunscreen and bring more with you. Reusable water bottle: Bring more water than you think you will need. Sunglasses or other protective eyewear: We were glad we brought sunglasses with the sun, and they helped to protect our eyes from dust, etc. Make sure everyone has sunglasses. If it’s not sunny, make sure everyone wears protective lens. It was windy and dust was blowing a lot. Protect your eyes. Smartphone/Camera: Put it in a resealable bag so it’s protected from the dust. Colored bag/backpack: We put our phones and snacks in our bag but it also served as a great place to mark as a “home base” for our ever-growing fossil collection. Snacks: Depending on how long you will be at the quarry, it might be wise to bring snacks to leave in the car or put in your bag. You will not want to leave and drive to get food. Warfield Fossil Quarries / Fossil Safari in a remote area, so bring something easy to eat, like granola bars. Bubble wrap & newspaper: You want to be sure you can safely bring your fossils home. We didn’t come prepared but luckily had beach towels and blankets to protect the fossils until we could buy bubble wrap on the drive home. Change of clothes. You may well be covered in dust like we were. Just go with it as part of the experience. I had our kids change into shorts and flip flips before getting in the car. Maybe the day we were there was particularly windy but we were covered in dust. It was all part of the fun. Know to only bring what you need to the site. You can always walk back to your car which will be very close by. We brought a bag that was easy to wash to store a few snacks, our water bottles, and smartphone (to take pictures) wrapped in its own Zip-loc bag. It’s so important to stay in one area, as the staff will suggest. We saw a group there at first moving from place to place because they always thought the rock was “better” somewhere else. Once they stayed in one place, they started finding several fossils. There are rows and rows of rocks to choose from. George was incredibly helpful and patient and provided excellent instructions. Stay in the same spot and look through the rocks where you are. We saw some people walking all over only to be discouraged they weren’t finding any. Even though there were fresh piles on the ground, there were customers wanting to search the quarry walls. It was fine to go there but it’s important first to take time with the rocks that Fossil Safari already has put down. On Fossil Safari’s website they recommend a visit to Fossil Butte National Monument. I read this after we already went there but let me tell you, you absolutely should go to the monument first. Learn all you can about Fossil Lake and about all the fossils that were found in this fossil-rich area. You will learn a lot which will help you as you enjoy your own fossil dig. 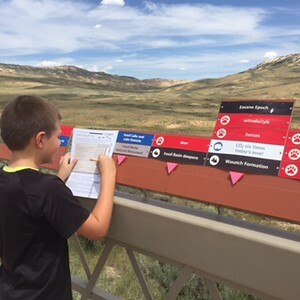 If you go to Fossil Butte National Monument, try the hike up on a Friday or Saturday in the summer when they have staff finding and marking the fossils in the rock. They also have a Visitor’s Center with an extensive fossil collection, a Junior Ranger Program and several interactive displays. Their timeline outside is incredible. You can easily plan a trip around visiting Fossil Butte National Monument and Fossil Safari. Plan for a minimum of two days in the Kemmerer, Wyoming area. What to do with all the fossils? When we first checked in, George gave us a paper with directions about how to seal the fossils at home. He was also very helpful explaining how to mount a large piece on our wall later in the day. 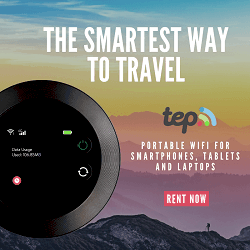 Know that you will be going to a remote area. Check Fossil Safari’s website for the map and for precautions when driving on the road. It’s about seven miles from the main road. The first road we were on was a rural dirt road. Later on we were driving on a gravel unimproved road. You will pass four cattle guards total. What are the recommended ages for Fossil Safari? Going on a fossil hunt and finding fossils are incredible experiences. Children can participate and learn a lot. If they take direction well, and you can trust them with tools, you might want your five or six year old try it. They have to be able to hold the hammer and chisel or have an adult help them. Will he/she be safe with tools? If they are patient, they will enjoy it. It really depends on your child. It was wonderful seeing the kids there being patient and doing things the right way. All the kids were well behaved and seemed to be following directions well. This was a phenomenal experience for kids to learn history and learn about fossils. They can learn to identify the fossils you will find. It’s also a great chance to teach them about how the earth formed into layers after millions of years and opens their minds to the work of paleontologists and geologists. Adults will learn a lot about fossils as well. How much time do you need at Fossil Safari? Most people seemed to purchase the four hour rate. Time flies out there even with the sun. It is just so fun for kids and adults. The full day is also an option but mostly likely after 1.5 – 2.5 you will find enough fossils. If you decide to stay for just an hour instead of longer, be sure to trim your fossils after your time expires so that you aren’t using your fossil-finding time. The hardest part wasn’t having patience to find the fish fossils, it was being patient when we did find them. We found several full fish specimens that we tried to reduce down because they were surrounded by excess rock. Tip: Ask one of the helpful staff members to help you so you can see how to do it. Sometimes even when you do everything right they still split. It just depends on the makeup of the rock it is in. So before you try to make it smaller, think how you will feel if by trying to reduce it you split it. Even if you do break the fish fossil and don’t have the entire fish, it’s still really amazing. Just think if you were out and found even a portion of a fossil somewhere…. How thrilled you would be! It is important to remember how these are 30 – 50 million years old. 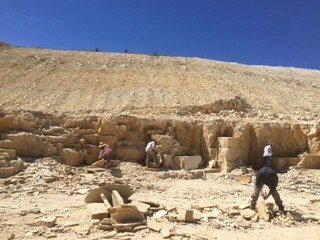 If you are looking for a great quarry to hunt for fossils, Fossil Safari at Warfield Fossil Quarries near Kemmerer in southwestern WY is the place. NW of Kemmerer off Wyoming Highway 233. Phone: 307-883-2445 or 307-851-0987. You don’t need to call in advance; just show up. Remember to print out a map or take a picture of it on your phone to access their exact location. Again, there is a 7 mile road to their site. The first stretch of road is easier on your tires than the second portion but take it slow and you should be fine. We weren’t sure what to expect about restrooms given this was a quarry. We were pleasantly surprised to find a decent port-a-potty with plenty of toilet paper rolls and hand sanitizer. There isn’t running water here so come prepared. None of us really knew what to expect as we’ve never heard of hunting fossils. We all thought it would be a small section to choose from and that the staff would tell us what pieces to cut into. My children loved that they could sit in one place and choose the pieces they wanted. One of my sons favored the large slabs and patiently took the time to hammer and chisel down to the last layer. When we got into the car and were driving out, I asked what my kids what they thought about finding fossils. Both boys thought there would be small slabs that they would assign us and didn’t think there would be thousands of rocks to choose from in each row. We love exploring. Some of our more recent vacations have included going to Crater of Diamonds State Park to look for diamonds and to Florida to hunt for shark teeth. But we’d never heard of fossil hunting and fossil digging until this trip. It was our favorite of the three, and we can’t wait to go again. 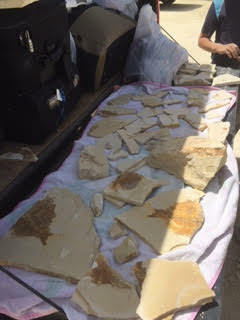 We were thrilled we went fossil hunting on our trip from Milwaukee and Chicago and then to Iowa, Nebraska and Wyoming. 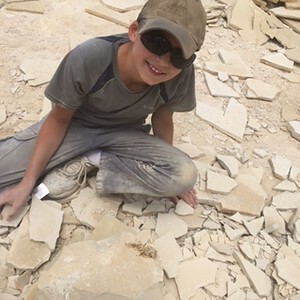 Hands down, Wartime Fossil Quarries, Fossil Safari, is the place to go to find fossils. We have taken our kids across the country to museums, Legoland California, Legoland Chicago and to amusement parks which are fun but this is a real experience. My one son learned about fossils in school so it was a true gift to be able have him experience this in real life. The fun is in the hunting and searching for the fish fossils, not only finding them. Fossil hunting is an amazing opportunity you will always remember. We left Iowa and Nebraska and made our way through Wyoming for our month-long road trip. There’s so much to do in Wyoming with kids. Enjoy nature, history, geology, ecology and more. Here’s what to do when you have three days in Wyoming. Driving on I-80, you’ll enjoy beautiful views. There are many interesting museums in southeastern Wyoming. Unfortunately, we didn’t stop at the Dinosaur Bone Home in Medicine Bow, Wyoming. It’s currently closed for tours, but it would have made for a great photo opportunity. We stopped in Buford, WY, America’s smallest town with a population of one person. It was up for sale in 2012 and sold to an entrepreneur. Can you imagine having your own zip code? Visit the mart and get some coffee and a snack. Just up the road from the mini-mart is a noteworthy tree growing in a rock, Tree Rock. There is a convenient frontage-type road so you can pull over safely. There are some signs which explain the tree and the mountains in the distance. It was a great place to let the kids climb on the rock and to run around. Make sure to stop at the Summit Rest Area at Exit 323 on Interstate 80. This rest stop has great maps and lots of pamphlets about places in the area. The Visitor’s Center has a nice mini-museum complete with a grizzly bear, a photo opportunity to wear a prison suit, and an opportunity to hold a sign for the territorial prison. There is lots of information, including the fact that over 50% of Wyoming is publicly owned, with many interactive displays. It’s free so it was a great place to stop and learn more about the area. There were two employees behind a desk available to answer questions and make suggestions about where to go. Both were very helpful.The Abraham Lincoln Memorial Monument was erected at the highest point in the Lincoln Highway at 8,640 feet in elevation. Lincoln Highway is also known as Route 30, named after President Abraham Lincoln. It stretches from the Atlantic Ocean in Atlantic City, NJ to the Pacific Ocean in Astoria, Oregon. We don’t do too many restaurant reviews but we all loved our experience so much at Buck’s Sports Grill in Rawlins, that I have to mention it. Our youngest loves steak so we wanted to try a local place around Rawlins. 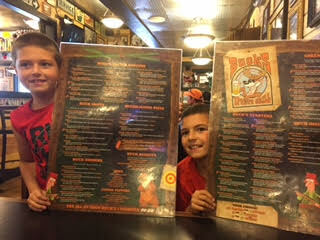 We saw Buck’s Sports Grill so we decided to check it out. It is very kid friendly with large booths. The server gave us huge menus — literally! Not only were they large in size but there were so many choices. You can choose from 26 appetizers and at least nine salads, and our friendly waitress gave us a choice of four soups as well. There were six foot-long hotdog options. There were 18 butter burgers to choose from. We counted eight kinds of 12″ pizzas to choose from. There are also Buck Shots (sandwiches), Buck Baskets (shrimp, tenders, cod, ribs, etc. ), and Buck Dinners (12 oz and 16 oz steaks, chicken, cowboy spaghetti, etc.). As if that wasn’t enough, there was also a children’s menu with cheeseburgers, mac and cheese, etc. My steak-loving son ordered steak off the adult menu and said it was the best meal he’s had in ages. Ha! Come hungry. You will love this place! I loved my blue cheese wedge salad and chili which came with a cheese quesadilla on the side. Do you ever order soup and salad and leave hungry? I even ordered a loaded baked potato and didn’t even touch it, and it too was large. The steaks were fantastic and portions were large. We will be back our next time through. We spent the evening in Rawlins, Wyoming and set out for the hour and fifteen minute drive to Kemmerer, Wyoming the next morning. My fourth grader’s teacher is a geologist and loves science. She recommended this place to us as our sons love fossils, rocks, nature, and exploring in general. Located in the southwestern part of Wyoming, it contains fossils from 50 million years ago. Before you do anything else in Kemmerer, Wyoming, be sure to plan a day at Fossil Butte National Monument. We spent about five hours here which included a hike. It’s free too. There’s a lot to see at the Fossil Butte National Monument Visitor’s Center. The staff there are amazing as well. There is a small theater with a video presentation. 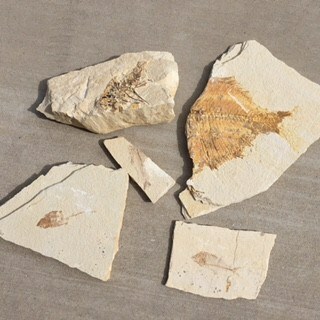 You and your child will have fun seeing all of the fossils that people found in ancient Fossil Lake. After you spend a little time exploring the center, ask at the counter for the Junior Ranger Program. You and your child will learn even more and be more familiar with where you might find some of the answers. Outside the building there is a long timeline which really gives a great sense of prehistoric life and the changes and evolution to the present time. We looked at this briefly before first entering the building but spent a lot of time with it when my children were answering questions for the Junior Ranger Program. Plan your visit to come on a Friday or Saturday in the summer. 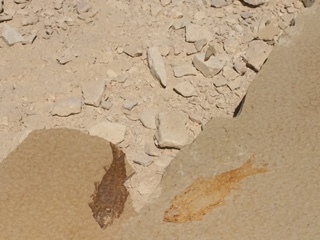 You take a hike to see a paleontologist unearth, study and measure fish fossils. Please note, your child will not be able to help with anything. Unfortunately, on the website, it said it was an interactive experience for kids. That was a disappointment as when I asked about it, the staff told me they haven’t done it in over five years. Hopefully, they will change this on their website. Still, it was interesting, and we learned a lot. I will say the staff described the hike as a half mile but it seemed much longer; maybe it was the heat. Bring enough water, wear sunscreen and a hat. You absolutely will want to put on bug spray as well. Buy some at the Visitor’s Center if you didn’t bring any. When you get near the meeting spot, there are lots of mosquito. We saw a few people get about halfway up to the meeting spot and turn around. It might have been due to the heat or elevation and maybe because it does seem like it’s more than half a mile. It’s also beautiful to drive the area and take in the views. Stop for a picnic and enjoy the wildlife. Get a map from the Visitor’s Center as there are lots of trails in the area. Some are more groomed than others and they range in difficulty. Stop first at the Visitor’s Center and ask for recommendations based on what you are looking to do. If you are anywhere in the southwestern part of Wyoming, be sure to stop at Fossil Butte National Monument. We love visiting America’s amazing National Parks. 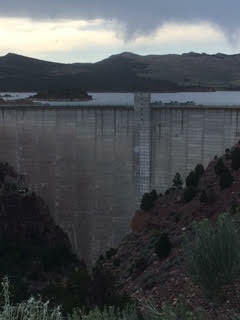 Take a drive to see this amazing dam bridge. We walked along part of the Green River and saw some people fishing. We didn’t stay long but wanted to see the bridge and dam. Unfortunately, the Flaming Gorge Visitor Center was closed by the time we arrived. 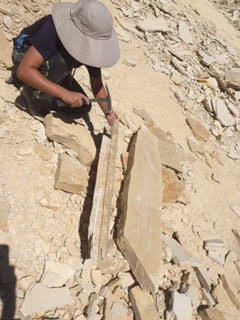 After visiting Fossil Butte National Monument, we were excited to find fossils ourselves. We have taken our kids to Siesta Key in Florida to find shark teeth. We have also gone to Arkansas for diamond mining. Of them all, hunting for fossils at Fossil Safari was our favorite. Come prepared to get dusty. Wear sun protection, closed shoes, sunglasses, and bring lots of water. 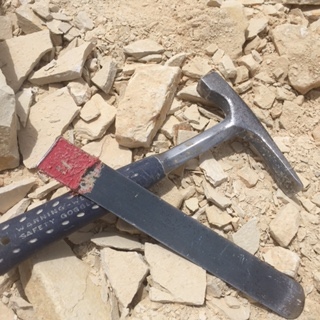 This is a great place to hammer and chisel your way to finding fish fossils from the Eocene Epoch. We found so many different kinds of fish fossils. This was an incredible hands-on opportunity. What’s even better is you can keep all the fish fossils you find. You can choose to stay for one hour, four hours, or all day which is eight hours. 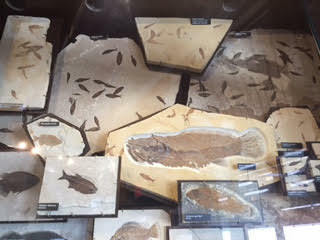 Whichever you choose, know you will find fish fossils. Bring enough food and water as Fossil Safari is in a remote quarry, seven miles off the main road, so you won’t want to leave to eat and then come back. They will give you a hammer and chisel as well as a demonstration of what to do and how to carefully go layer-by-layer in the rock. After that, you are free to pick which rocks you want to split. The friendly staff will be around to help you and answer questions about your fossil finds. Do be sure to go to Fossil Butte National Monument first before going to Fossil Safari. You will have a better understanding and appreciation of the area and of the incredible fish fossils you will find. We were so sad we missed this as we drove past it on our way out of town and didn’t make time to stop because we were dusty and hungry after spending the day at Fossil Safari. Afterwards, we looked up reviews of it and wish we did stop as it looked very interesting. It’s on our list for next time, for sure. Do check the website in advance if you are there during winter months. Can you tell our family loves fossils? 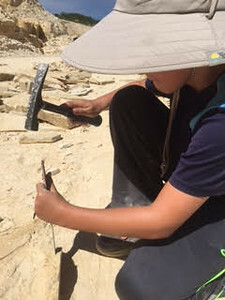 Wyoming is a great place for kids to learn hands-on about fossils. They’ll see and learn much more than they will from a book. These are awesome things to see and do in Wyoming with kids. We are lucky our children travel well, as we took a long road trip from the Midwest, covering Milwaukee, Chicago, Iowa and Nebraska. After visiting Wyoming, we made our way to Utah and to Arizona. We are excited to return to Wyoming. Are you the type of person who’s a sucker for cowboy hats and boots? Do you dig things that have something to do about the wild, wild west? Then you should schedule a trip to the sleepy city of Cody in Wyoming. The cowboy town Cody, Wyoming has generated a lot of buzz from people who have a deep interest and fascination with the American west. Cody, Wyoming is a city with less than 10,000 residents as of the 2010 Census. This small town serves as a gateway to the eastern side of the Yellowstone National Park, a 3,500 square mile wilderness recreational area that is located in Wyoming, Montana, and Idaho. The town was named after Colonel William Cody, or Buffalo Bill. He was a bison hunter, scout and showman who went on to become one of the most influential figures of the American Old West. He is best known for Buffalo Bill’s Wild West, a circus-like attraction which displayed cowboy themed shows and episodes. 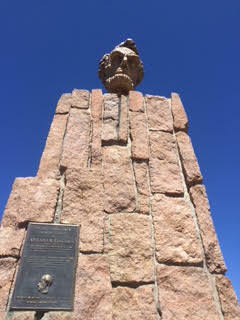 Buffalo Bill, a native of Wyoming, had traveled extensively in the area starting in the 1870’s. He was impressed with the potential of the place and its proximity to Yellowstone which was declared a national park by then US President Ulysses Grant in 1882. He also fell in love with the scenic views, fertile soil and the hunting possibilities in the region. During breaks from his Wild West tours in Europe, Buffalo Bill would often go back to his home state. He started to build a town in the area in the mid-1890’s. In fact, many of the streets in the town were named after Buffalo Bill’s associates—Bleinstein, Salsbury, Rumsey, Alger, and Beck. In 1901, the town was formally incorporated. A year later, Buffalo Bill built the Irma Hotel which was named after his daughter. The hotel stood in today’s city center. He also completed the construction of the Pahaska Tepee and Wapiti Inn to accommodate travelers. Eventually, Buffalo Bill would establish the TE Ranch about 30 miles from Cody. He then bought more land to increase the size of his ranch. Before he died, the showman had more than 8,000 acres of private land which hosted around 1,000 head of cattle. Cody’s reputation as a cowboy town is not only due to the contributions of Buffalo Bill. Its environment can also be credited as a reason why the cowboy culture thrives in this city. For instance, check out the road that connects the town to the eastern side of the Yellowstone National Park—the Buffalo Bill Scenic Byway. Hands down one of the most picturesque drives in the country, the byway winds through an awe-inspiring scene featuring rock formations and mountain vistas. There are also lots of spots along the way where you can pause to spot local wildlife, ride horses, hike, or fish. Today, there are several structures around the city that would give you the impression that cowboy culture really thrives in Cody. These structures prove that Buffalo Bill left a legacy in the town he built. Despite its proximity to Yellowstone National Park and hip Jackson Hole, Cody, Wyoming remains grounded as an authentic cowboy town in the heart of ranching country. While it sports its share of souvenir shops, visitors are more likely to find camping gear, cowboy hats, and pocket knives for sale than expensive outdoor gear or trendy vacation t-shirts. Hometown coffee shops intermingle with world-class museums on the American West, and the car you’re most likely to spot is a pick-up truck, loose straw fluttering out of the bed as it picks up speed after the light. Here’s Cody, Wyoming as we saw it on an early summer day in June. The Buffalo Bill Village is historic because it was here where the construction crew that built the city stayed in the early 1900’s. Today, it has 83 individual cabins. Guests would surely be impressed with the nostalgic interiors of the village, which looks like a structure straight out of an Old West movie. The village is open from May through September. It’s kept its Old West exterior. Also, the rooms are what you would expect from a lodging option in a typical American western town— with wood paneling, rodeo-patterned curtains and bedspreads, and basic amenities. The cabins differ from single units with king-size beds to family suites with two bedrooms. The historic hotel building, built in the 1920’s, serves as the hotel’s main front desk. It’s a great place for families to stay because it is only a few meters from the Cody downtown area. Just a mile away from the village is the Buffalo Bill Center of the West which features five museums and a research library that houses artifacts of the American West. Meanwhile the Cody Nite Rodeo is less than two miles away from the village. If being housed at the Buffalo Bill Village fails to put you in a cowboy vibe then taking part in the Cody Nite Rodeo should do that to you. The Cody Nite Rodeo held nightly is proof that this city is the Rodeo Capital of the World. It is the longest running rodeo in the world, apart from being the only one held every night. It started in 1938. Currently, it’s produced by the Mo Betta Rodeo Company and Tate Family. It runs every night from June 1 to August 31. There’s also the Cody Stampede Rodeo which takes place from July 1 to July 4, which is part of the town’s celebration of Independence Day. Gates usually open at 7 in the evening, with the rodeo action starting an hour later. You can buy tickets online, as well as at restaurants, hotels and at the rodeo grounds. Children get a discount. And children who are under six years old are admitted to the event for free. The Cody Stampede Rodeo, which is the bigger event, has tickets that are a bit more expensive. Organizers even tap a bus that goes around town every night to collect rodeo spectators, transporting them to the event for a small fee per individual. The event is fun and entertaining, to say the least. Cowboys from various parts of the country take part in games and competitions like bulldogging, calf roping, calf scrambling, among others. There are even games for big children. If you want a more in-depth look at the history of America, particularly the Native American history, then you should drop by the Plains Indians Museum. This is one of the five museums of the Buffalo Bill Center of the West which was mentioned earlier. Located along Sheridan Avenue in downtown Cody, the Buffalo Bill Center of the West has four other museums. The Buffalo Bill Museum, Cody Firearms Museum, Draper Natural History Museum, and Whitney Western Arm Museum. The Plains Indian Museum showcases the lives of the Plain Indians, particularly their history, culture and traditions. The collection of the museum came from clothing and accouterments of Native American performers who took part in the Wild West shows of Buffalo Bill from 1883 to 1913. In recent years, the museum’s collection was boosted by major private art collectors and contemporary Plains Native artists. Every year, more than 300 dancers and 28 tribes are represented in the annual Powwow. Lastly, stepping into the Cody Wyoming Old Trail Town is like being transported back in time, when the cowboys and American Indians were the ones running the show, so to speak. In fact, you’ll mistake the old trail town as a Hollywood set. But the truth is that this is the original townsite of Cody. This is the same site where Buffalo Bill, in 1895, laid down the foundation of what is now the city of Cody, Wyoming. Cody’s old trail town is akin to a living museum. After all, there are 26 historic buildings that go back to the late 19th century that remain standing up to this day in the said place. You can have photos taken before atmospheric saloons and trapper cabins, or inspect some covered wagons. You can even say a prayer or two to some of the early settlers whose remains are buried at a historic cemetery. In fact, one of those whose remains are in the said cemetery is that of mountain man John Johnson. He was memorably portrayed by Robert Redford in the movie “Jeremiah Johnson” in the 70s. Some of the structures and furnishings were actually imported from remote locations in nearby Montana. Western historian Bob Edgar and some of his friends were responsible for disassembling, transporting, and reassembling those structures at Old Trail Town. The old town trail also has some of the original cabins of outlaws Butch Cassidy and the Sundance Kid. The saloon in Wyoming that was often visited by Cassidy’s notorious Hole in the Wall gang is also on this site. Also on the area is a log cabin of a Crow Indian army scout who assisted Col. George Custer and the 7th U.S. Cavalry during the Little Big Horn battle in 1876. Indeed, the town of Cody in Wyoming is in a class of its own. It has pretty much preserved the legacy of Buffalo Bill as shown by the number of historic structures that remain in the city, as well as the different activities regularly conducted. The cowboy town of Cody, Wyoming is one place you should visit.